7% of American adults (17.3 million people) believe that chocolate milk comes from brown cows. There's no source to their claim. Is there any truth to their statement? According to CNN, the number is from an online survey by the Innovation Center for U.S. Dairy. The website of the center does not contain the survey question or any other information about this issue, and a website related to the center only contains a brief news article, which points to a Today news article (the undeniablydairy.org website named in the graphic only contains a link to the same Today article). 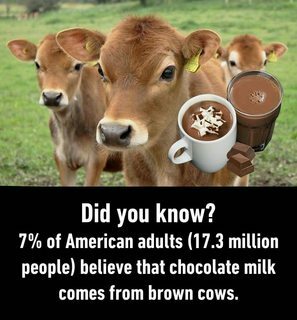 The Today article expands the claim, stating that in addition to 7% of people believing that chocolate milk comes from brown cows, 48% of people were unsure of where it comes from. The Washington Post puts this number in a larger context of American illiteracy of agriculture. Not the answer you're looking for? Browse other questions tagged united-states nutrition milk . Does cows' milk contain blood? Is cows' milk bad for cats? Did the United States' internment involve Japanese foreign nationals? Is lactose intolerance an outdated diagnosis for discomfort after milk?